Steve Evans admits he’s full of admiration for Morecambe’s Kevin Ellison ahead of bringing his Mansfield side to the Globe Arena. The Shrimps veteran has eight goals so far this season and continues to be a key figure of Jim Bentley’s side a month shy of his 39th birthday. “I love him,” Stags boss Evans said. “When I arrived at Rotherham, Kevin had just been allowed to leave. “I couldn’t believe they’d let someone like him go as he moans. I love players that moan! “When they are moaning they want things to be better. “They are frustrated with themselves. They maybe want something different on the coaching side. “I love Kevin Ellison as a person as well. “He ran the length of the pitch to celebrate a late winner against my Rotherham side – and I hated him! Despite the Shrimps being 19th and their visitors seventh in the table, Evans believes a trip to the Globe Arena remains one of the toughest games in League Two. “At home they win games against good teams,” he said. 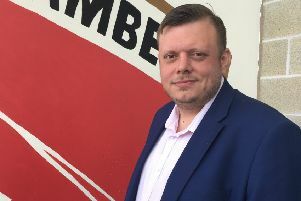 “If we are still sitting on the same points differential to the top boys when we leave Morecambe we will be really pleased as I see it as one of the tougher games of the season.